Once again, my french toast is sticking to the skillet pan and will probably tear into two pieces when I try to flip it over. How annoying! And yesterday, it was a real challenge trying to scrape the burnt cheese off of the skillet pan after making grilled cheese sandwiches for the children. I’ve been meaning to do some shopping for new skillets, but I keep forgetting. And this time, I’d like to buy a great nonstick skillet pan. For once, I’d like to have a stress free time in the kitchen when it comes to flipping my food with the spatula, removing it from the pan, and cleaning the pan. But what are the best kinds of nonstick skillets? I remember how those cast iron skillets were the original nonstick skillet pans before Teflon was invented. However, I’d like to buy something more modern with a stylish design. There are many choices out there – especially when it comes to name brands, material type, your oven type, and price range. This article will cover some of the best nonstick skillets to buy and tell about some of their features and benefits. When you’re ready to go shopping for your new nonstick skillet, you’ll be better informed about which skillet is for you. The most common nonstick skillet pan you’ll come across on the market are those made with aluminum. Aluminum is a great conductor of heat. This is good for cookware because it keeps your food to cooking evenly and your pan won’t get funny stains on the bottom where certain spots tend to overheat. Aluminum is used at the base of many skillets along with a non-stick coating. Aluminum skillets are not very expensive. 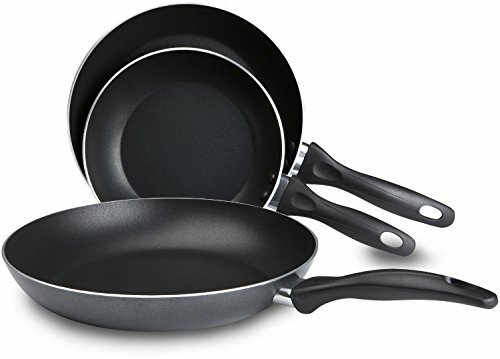 Below are three aluminum nonstick skillet pans that are PFOA Free (free of perfluorooctanoic acid), and have four and a half star ratings on Amazon. This skillet is created by ‘Happycall’ and is most compatible with an electric stove top. It is dishwasher safe and lightweight. It comes in different sizes and is scratch resistant. This one is made by ‘T-fal’, is dishwasher safe, comes in different sizes, and is also oven safe up to 350 degrees Fahrenheit. This skillet pan is from ‘All-Clad’, scratch resistant, dishwasher safe, comes in two different sizes, and is oven safe up to 500 degrees Fahrenheit. Nonstick skillets can also be made with stainless steel. Stainless steel is highly durable and creates an attractive appearance. These skillet pans are ideal for searing meat because they can handle high temperatures better. One thing you may really like about a stainless steel skillet pan is that it doesn’t react with your food. The coatings on these skillets can remain intact for about a year. Below are three stainless steel nonstick skillets that have four and a half star ratings on Amazon. This skillet pan is designed by ‘Cuisinart’ and features an aluminum encapsulated base which causes the skillet to heat quickly and evenly. It is dishwasher safe, has a cool grip handle, and is available in many sizes. 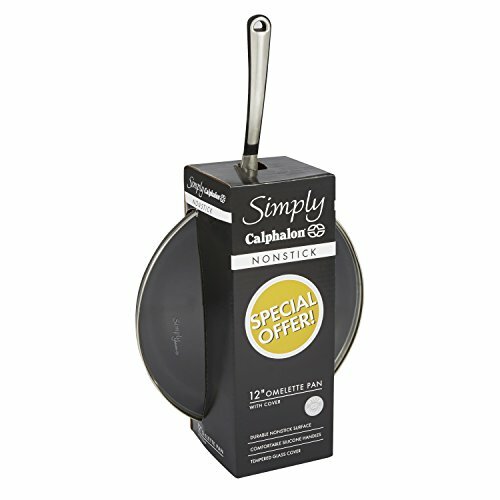 This skillet pan is manufactured by ‘Calphalon’ and is compatible with a gas stove top. 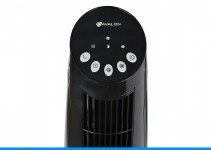 It comes with a lid and has a hard anodized aluminum construction for improved heat conductivity. It is oven safe up to 400 degrees Fahrenheit and the handle stays cool while cooking on the stove top. This skillet is made by ‘Circulon’ and is built with an amazing Food Release System. It is compatible with an induction stove top and is oven safe up to 400 degrees Fahrenheit. It also has a very stylish rubberized handle, and comes in 2 different sizes. When it comes to cookware, ceramic is a fairly new material in the marketplace. Ceramic is a great nonstick material. The best thing about ceramic skillets is that they are very environmental friendly and PFOA Free. One thing to keep in mind is that they are not the best heat conductors. 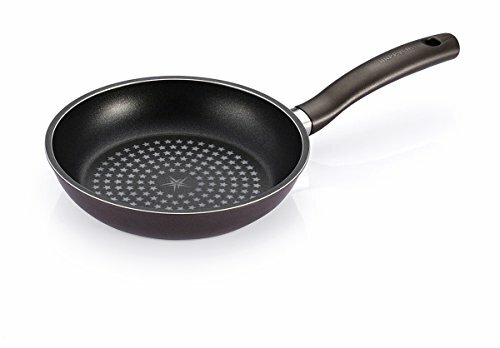 Below are two ceramic nonstick skillets with at least a four star rating on Amazon. 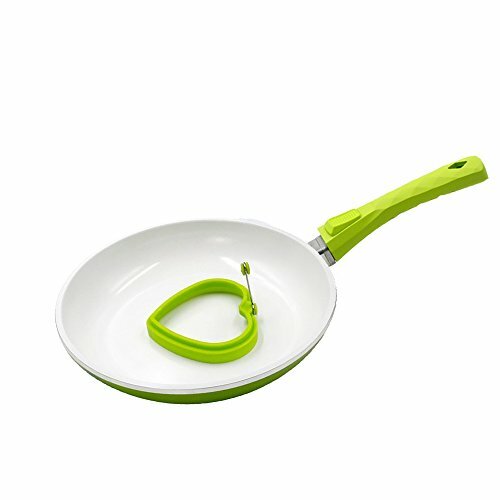 This skillet is made by ‘Pococina’ and has a detachable handle to help you save storage space. As an added bonus, it usually comes with a heart-shaped silicone egg/pancake ring. This one is from ‘Chef’s Star’ and has a heat resistant exterior so that the handle stays cool to the touch. It is dishwasher safe and available in two different sizes. Nowadays, many families have modern kitchen appliances, which may include an induction stove. You will want to take extra caution to be sure that your new nonstick skillet is compatible with your stove top. Below are three nonstick skillets you can consider buying that are ideal for your situation. 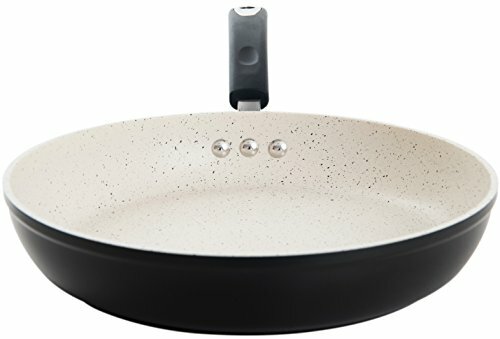 They are very high quality skillets with four and a half star ratings on Amazon. 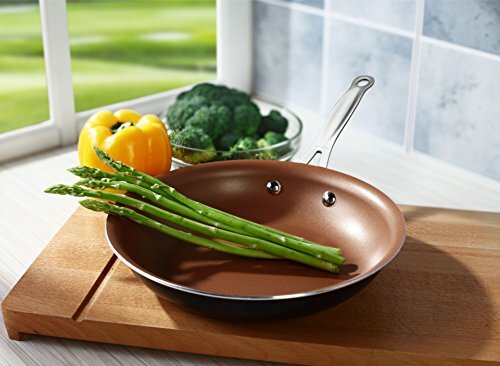 This skillet is made with a special stoneware from Germany that offersstrong nonstick protection. The interior is aluminum with a magnetized base for rapid heat transfer. It comes in different colors, has a hang-able handle, has a high quality scratch resistant, PFOA Free, and very eco-friendly. This skillet can be quite costly, but still a good buy because many prefer the non-chemical option. This is another one from ‘Cuisinart’. It comes with a glass cover, which doesn’t have a vent. The rims on this skillet are ideal for pouring food out without causing a mess. It’s oven safe up to 500 degrees Fahrenheit. 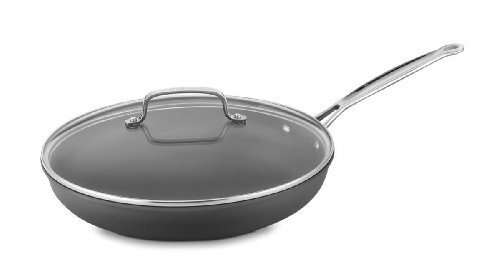 It has a quantanium nonstick interior that is reinforced with titanium for remarkable food release technology. 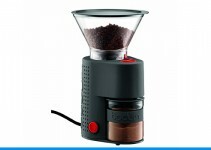 It is extra durable and has a heat resistant handle. It also comes with a limited lifetime warranty. This one is from ‘Cooksmark’. 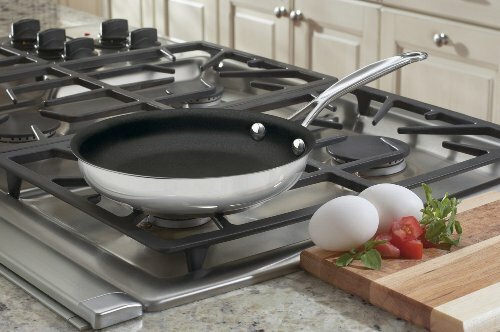 It’s an aluminum skillet that is actually compatible with every kind of stove top, so it offers the best of all worlds! It has a copper interior which makes it ultra durable, scratch resistant and wear resistant. And the base of the skillet has stainless steel which ensures quick and even heating. It’s dishwasher safe, has a comfortable grip handle from premium stainless steel, and is oven safe up to 400 degrees Fahrenheit. Now that we’ve examined a few of the top nonstick skillet options in detail, you should have a better idea of what you’re looking for when you go shopping. Nonstick skillets are good for cooking delicate items like eggs, soups, cheesy pasta, etc. 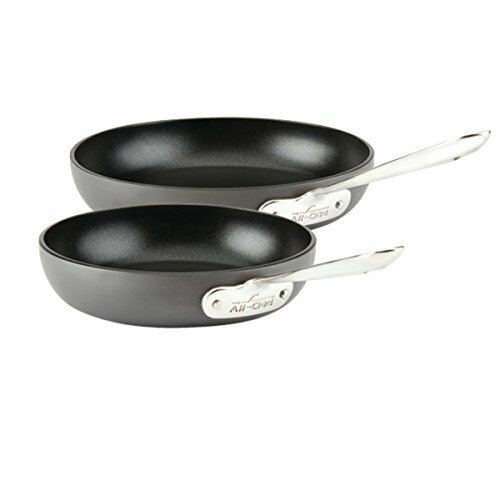 The nonstick coating inside of these skillets may start to break down at high temperatures, so using your nonstick skillet is a good choice when cooking at medium to medium-high temperatures. You can also keep the nonstick coating in good condition by using rubber spatulas and utensils while cooking to prevent scratches in your new pan.